There are less than 1,000 souls in the town of Dardesheim. But the village and its 80,000 neighbors in the county of Halberstadt in the former East Germany have an expansive spirit. 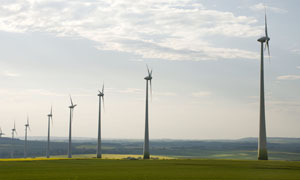 They want to become Germany's renewable energy city. They want to become 100% renewable using solar, wind, and biomass. The renewable energy projects are part of the villages' efforts to create new jobs and businesses, increase energy security, and by doing so reduce international conflicts over energy. They want to do their part so they and others can live in peace. le energy. Four pioneering wind turbines were installed in the mid-1990s, collectively producing one million kWh per year. The more extensive project has been in the works since then. eptance but eager participation has been successful. In contrast to projects of this size elsewhere, Heinrich Bartelt noted that there was little if any opposition. Since the first turbine was installed in 1993, residents have remained supportive. Bartelt should know. He installed those early turbines. 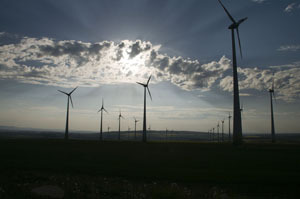 Formerly with the Bundesverband WindEnergie, the German wind turbine owners association, Bartelt has made a personal commitment to the region. In 2006 they developed a 62 MW wind project comprising 28 Enercon E70s and one E112, a giant 6 MW turbine. 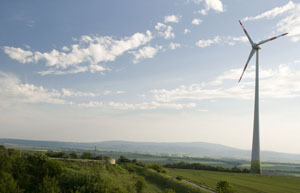 The E112 alone is expected to produce from 12 to 15 million kWh per year, enough to meet the electrical needs of 4,000 households in this region of Germany. Altogether, the wind turbines will generate from 120 to 130 million kWh annually, enough to meet the needs of nearly all the 80,000 residents of the county. The Dardesheim project includes an information center on renewable energy at a former Russian anti-ballistic missile radar station atop Druiberg. By the end of 2007, developers expect to install an Enercon E70 on the hilltop with an observation platform for tourists visiting the region north of the Harz mountains. They also installed nine different solar PV plants: five private projects totaling 170 kW, and four projects at the Druiberg wind plant totaling 210 kW. During their first year of operation the combined 380 kW of solar PV generated nearly 250,000 kWh, about one-third of the Dardesheim's domestic electricity consumption. Warming to his theme, Alt notes that in many old languages, "wind" is synonymous with the word for "spirit", as in the "holy spirit". "What you are doing here with your wind energy," said Alt, "is intelligent, economic, and forward thinking." This willingness to share the benefits is reflected in the royalties paid for the land leases. Bartelt reported in an interview in the fall of 2006 that wind energy land leases (pacht in German) pay typically 3%-5% of gross project revenues. But the royalty is not paid only to the landowner where a turbine stands, but to nearby landowners as well. 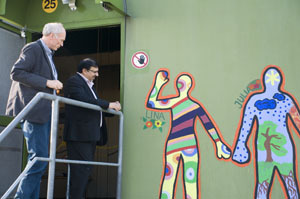 In the Dardesheim projects, for example, Bartelt sets aside 1% of this 5% for the nearest villages. Of this 1% a portion is set aside for community groups, sports halls, and so on. Of the 4% remaining half is paid to the landowner (2%) with wind development and half (2%) is distributed among surrounding landowners. In this way, everyone benefits. Bartelt's Dardesheim project also includes a biomass central heating plant that serves the entire village and local farmers use rapeseed to produce oil for local transport and farm machinery. The economic fallout has been immediate. Enercon has opened an eight person service center in Dardesheim and in the nearby village of Zilly the former black smith employs 2 colleagues to maintain the old two-blade machines. Hikers, joggers, and bicyclists can enjoy the wind farm or grab a cup of coffee at a nearby guest house. 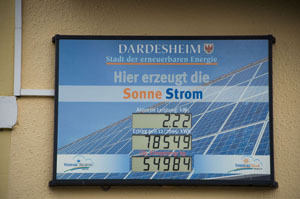 The people of Dardesheim have built a model community and model energy supply, doing their part to reduce their consumption of fossil fuels and build a future for their children. 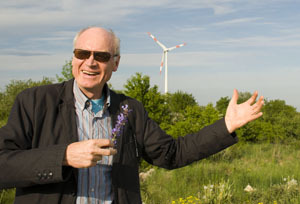 Heinrich Bartelt is the force behind the Dardesheim 100% renewable energy village concept. 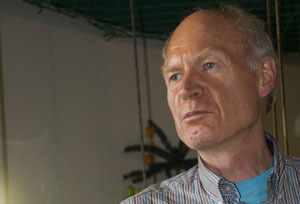 Heinrich Bartelt is one of Germany's wind energy pioneers and a long-time leader in the German wind turbine owners association. 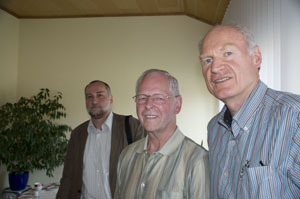 Ralf Voigt is one of the members of RegenerativeKraftwerke Harz with Heinrich Bartelt. 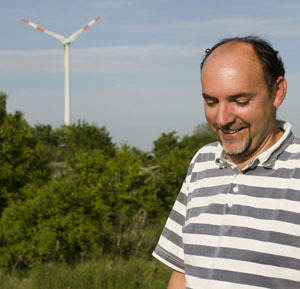 Thomas Radach, technical manager of Windpark Druiberg, is from a family of German wind pioneers. 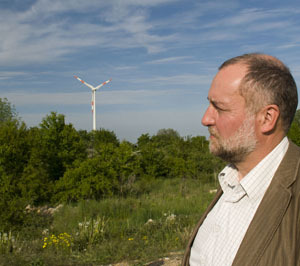 His father installed some of the first Lagerwey turbines in Germany. After more than two decades they are still in operation on Druiberg, the hill overlooking Dardesheim. Entering Enercon's giant E-126 on Druiberg overlooking Dardesheim. Local students painted the base of the tower in art contest. The wind turbines atop Druiberg are within sight of one of Germany's most famous mountaintops, Brocken , located in the former East Germany's Harz Mountains. Brocken is the site of the witches' sabbath in Goethe's Faust. Hotel Adler and its rooftop solar array are part of the Dardesheim renewable energy project. 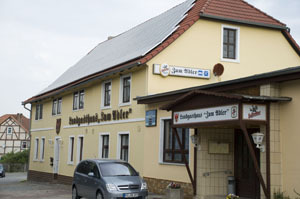 As in many community solar energy projects in Germany, data on the production of electricity is made publicly available as here on the Hotel Adler. 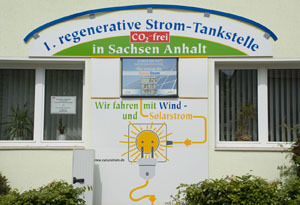 Instantaneous kW is on the top row, total kWh generated since installation in 2005 on the middle row, and at the bottom total carbon dioxide offset. 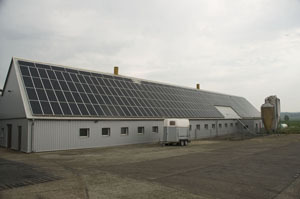 Solar pigsty in village near Dardesheim. 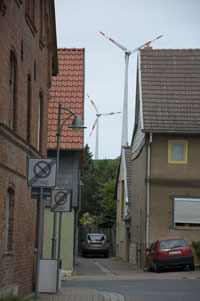 Wind turbines atop Druiberg are visible throughout the village.